South African local government elections, held Aug. 3 but only recently resolved, produced major upsets for the ruling African National Congress. The statutory two weeks allotted after the elections to form governments was certainly needed this time in a number of major cities. The outcome also suggests an uneasy period for municipal governance in general and the A.N.C.’s leadership in the country. The vote produced a number of surprises, particularly in the nation’s large cities. Cape Town was held by the Democratic Alliance, not surprisingly since the Western Cape Province is generally the party’s stronghold. Durban in KwaZulu-Natal, similarly, returned the A.N.C. to power, as did Bloemfontein (in the Free State Province): no one expected upsets here. But what was shocking to the A.N.C. was the outcome in Johannesburg, Port Elizabeth/Nelson Mandela Bay Metro and City of Tshwane/Pretoria. In all three of these cities no party gained an outright majority, and in two of them—Port Elizabeth and Pretoria—the Democratic Alliance emerged with the largest percentage of votes. In all these areas smaller parties like the Economic Freedom Fighters (E.F.F. ), Congress of the People (COPE), United Democratic Movement (U.D.M.) and the African Christian Democratic Party (A.C.D.P.) will play important roles in coalition governments. Indeed crucial to governance by coalition will be the far left party, the E.F.F., whose overall performance in these elections has been poorer than it perhaps expected. Though it (characteristically) made a lot of noise during the campaign and drew in large crowds at its rallies, the E.F.F. was not able to translate public enthusiasm into municipal seats, confirming the opinion of some that the movement is more of an expression of poor and working-class discontent than a real radical challenge to A.N.C. hegemony. It is possible that on election day public discontent did not translate into new voters for the E.F.F. and that disaffected supporters of the ruling party simply declined to vote. (This would account for the deeply split results in hitherto A.N.C. strongholds). It is worth a closer look at these contested municipalities and metros because collectively they constitute the largest concentration of population in South Africa. Nelson Mandela Bay Metro has formed a coalition government led by the D.A. Though its majority is narrow (64 out of 120 seats), it is likely to be solid. In Johannesburg and Tshwane/Pretoria the D.A.’s hold on government is less solid. If the E.F.F. keeps to its word, these D.A. minority councils will be able to function, but things could get tricky if they implement policies the E.F.F. rejects or if significant changes occur on the broader national political stage. The latter point is very important. This election was not fought over issues of local governance but over the state of the nation, the A.N.C. 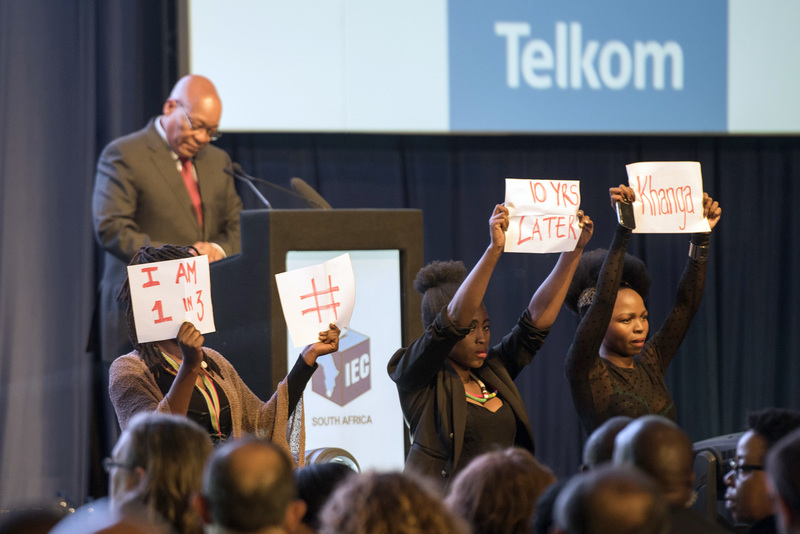 and the growing unpopularity of President Jacob Zuma. This accounts for lower than expected voter turnout in some areas—A.N.C. stalwarts who loathe Mr. Zuma but cannot imagine shifting their vote simply did not show—and the swing away from the A.N.C. in some areas. It is important to note that these cities tend to be more prosperous than the rest of the country and include a significant black middle class—indicators that the suspicion that Mr. Zuma’s governance is corrupt and bad for the economy has permeated deeply. The symbolism of such an outcome is important. Johannesburg, where the A.N.C. narrowly gained the most votes but where the D.A. is forming a minority council, is the economic hub of South Africa and the heartland of the new black middle class. Tshwane, which includes Pretoria, is the administrative capital of the country. Port Elizabeth in the Eastern Cape has for a century been “A.N.C. country,” a place where even during the hardest days of struggle against apartheid the movement could count on massive popular support. It is worth noting too that in Zuma’s rural KwaZulu-Natal hometown, Nkandla, the vote went to a mainly regional party, the Inkatha Freedom Party. In effect, wherever he is living as president—in Pretoria (the seat of the Presidency), in Cape Town (the seat of Parliament) or in his swanky homestead at Nkandla—Mr. Zuma now lives in opposition territory. It is anybody’s guess what the long term outcome of this election will be. For the Democratic Alliance in Pretoria and Johannesburg, governance is likely to be precarious—with strong possibilities that much-needed municipal reform and service delivery will be slowed or blocked by the party’s weakness. The economically fragile Port Elizabeth may in contrast see a renaissance of good municipal governance with attendant economic growth. For the E.F.F. the next few months and years will be crucial. Its supporters know the party can protest, but can it govern? The E.F.F. proving itself competent and honest at the municipal level will only improve its chances for the 2019 General Election. Much will depend on what the A.N.C. does next. If it dumps President Zuma and his cronies and commits itself to cleaning up its act, it may woo the E.F.F. into breaking its highly unusual and tenuous relationship with the D.A. Indeed it may also win back many current E.F.F. supporters. Though the party tends not to admit such things, these local elections have been a massive wake-up call to the A.N.C., particularly as it now looks to 2019. Local Elections 2016 could be a foretaste of General Election 2019—without a massive change in direction, the A.N.C. might well do even worse.